In this week’s paper I report how the heated grips on the Suzuki Burgman 650 could be warmer. Just about every journalist on the launch in Scotland seemed to agree on the point. Some said they seemed to work intermittently. Others questioned whether they worked at all. Suzuki scratched their heads and said they’d look into it. On the ride back to Peterborough, I had them on full blast and my hands were still cold, albeit in summer gloves. So the first thing I did on getting home was fit a pair of handlebar muffs. I know what you’re going to say: ‘Man-up. It’s May.’ But it still gets pretty cold. On an early morning ride in Kent on May 2, the thermometer on the Burgman’s dash read 3°C. With the muffs on, it became clear that the grips definitely worked. I had to turn them down from their highest setting. But there was a new problem. 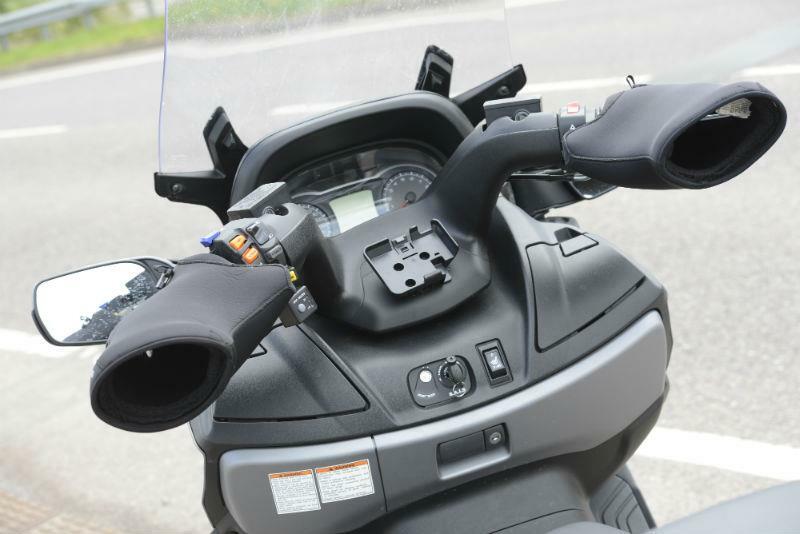 The Burgman’s mirrors are lower than other bikes’, looking under your arms . In the top quarter of each one you see your hand on the bar. With handlebar muffs fitted, too much rear vision is obscured. Too much for my liking, anyway, so I took them off. Now I’m back where I started. Yesterday, on my 80-mile ride home from work, the rain fell heavily and the temperature dropped to 8°C. The grips were on full blast and I could hardly feel any warmth. The short story is: they don’t get hot enough. It’s not disastrous just yet but will become a problem in winter. I’m thinking heated gloves. But isn’t that like buying a dog and barking yourself? Otherwise, I could hardly be enjoying the Burgman more. It’s the best vehicle in the world for my 160-mile daily commute. More about that in MCN, on sale May 15. "The comfort and practicality of a maxi-scooter but limited to 125cc"
"Ok so the Fuoco does have three wheels but in every other way it is a bike; it leans, stoppies, has handlebars and so on"
"What sets the Kymco apart numerically is its price"